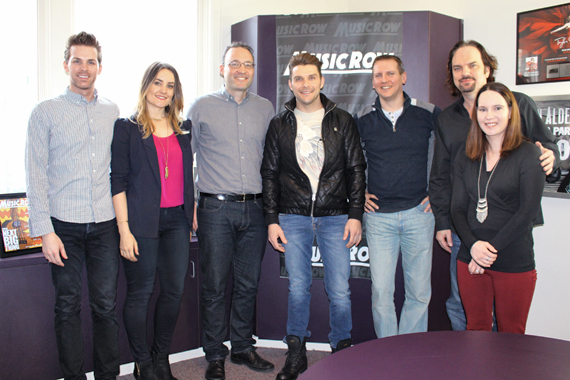 Robby Johnson visits with MusicRow staff. Canadian-born country singer Robby Johnson has high hopes for his new album, Don’t Look Back, which was recorded at Nashville’s Ocean Way, under the direction of producer James Stroud. The project is being distributed by TuneCore. The product of all that hustling is Johnson’s new 13-song project, which features songs from several top Nashville writers and artist-writers, including Sam Hunt, Chris Young, Josh Osborne, Luke Laird, JT Harding, Mark Nesler, Ashley Gorley, Brett James, John Ozier, Mary Dodson and, yes, Shane McAnally. Johnson’s current single, “Hate Me Tonight,” was penned by Jason Massey, Ryan Griffin, and Mark Carson. Johnson also employed star power in the studio, as Vince Gill lends his guitar prowess to “I Ain’t The Guy,” a track co-penned by Johnson, Juliana Cole, and Kellys Collins. Johnson returned the favor to his Canadian fans with the initial release of Don’t Look Back in Canada. The initial release was slated for January, but Johnson released physical copies early to a popular retailer in his home province of Quebec. Though Johnson has his sights set on success in the American country music market, he says his drive to become an American country star is motivated by far more than personal ambition.